A new update of GPU Shark is available. * fixed graphics memory type (GDDR6) for GeForce RTX GPUs. + added AMD Radeon RX 590 support. + added NVIDIA Quadro RTX 6000, RTX 5000 and RTX 4000 support. + added "utilization" and "boost_sync" limiting policies for NVIDIA GPUs.
! updated: ZoomGPU 1.22.1 (GPU monitoring library). 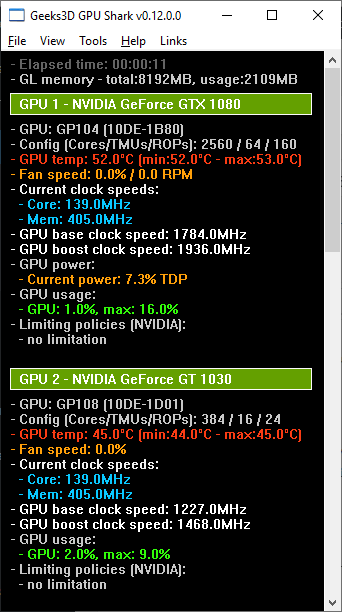 + added GPU power info (PowerTune) for Radeon HD 7000 series. - removed OpenCL info (GPU Caps Viewer has all you need for that). A new maintenance version of GPU Shark is available. + added NVIDIA GeForce RTX 2060 support.